That is right. You read it correctly. I went hiking with my pup Murphy yesterday. I am healing really well and quickly. Yesterday I enjoyed a hike with Murphy near our home in Baer Creek Canyon in Farmington, Utah. 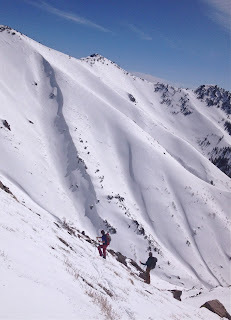 It has been two and a half months now since I crushed my pelvis and broke my spine in that gnarly crash on Cardiff Peak. The doctors are surprised and pleased with my progress and I am chalking it up to another blessed experience for this young skier. I am looking forward to next season already and I am motivated to get back into shape. 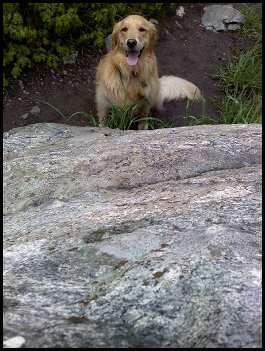 ^Muprhy is waiting for me to carry on up the canyon to her favorite spot. She loves this trail and loves hiking with her Pops. If I were healthier I would've climbed this small rock and Murphy likes to chase me up it. She can climb some pretty steep pitches. You'd be suprised. ^Murphy is the stickhunter. 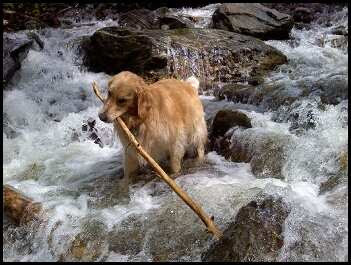 Her favorite activity on our hikes is to fetch sticks out of the rushing creek. She always tries to pull out the biggest sticks she can get her mouth around. Even some that she can't. It is pretty funny to watch her try to pull some of these monsters out. Spring runoff is running good right now, which makes her task even more challenging for her. I am really looking forward to getting back into shape with the help of my mini-motivator, Murphy.